Of course, you’ve heard of Savannah, Georgia, but how about its lesser-known barrier island counterpart, Tybee Island? This small city holds popular beaches, piers and pavilions, historic forts and batteries, and one of the most well-known lighthouses in the United States. A visit to Tybee Island will allow your group to enjoy seaside bliss, educational outings in the marshlands and flats, and historic enlightenment about local wartime involvements! Tybee Island Lighthouse in Georgia. 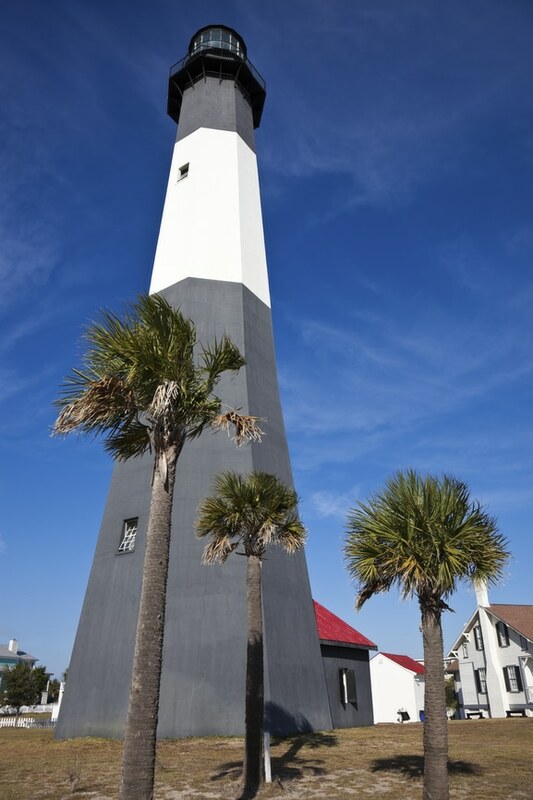 Tybee Island Light Station and Museum - The light station is one of only 7 surviving colonial-era lighthouse towers, an iconic structure made of brick, rock, and lumber that was first established here in 1736. The tower itself sits at 144', making it not only one of Georgia's oldest lighthouses, but also one of Georgia's tallest! Tybee Island Marine Science Center - Walks, Talks, and Treks - A visit to this science center will teach your group all about marine conservation, coastal rehab, rescue, and response programs, and marsh ecology. Choose a 60-minute program to attend, your options being Beach Walk, Jelly Jive, Marsh Talk, Turtle Talk, or Whale Tale. Afterward, you will choose a 30-minute beach activity, such as seining or sand sifting. You will end your visit with a tour of the Coastal Gallery, a truly ‘authentic coastal experience’. Little Tybee Island - Believe it or not, ‘Little Tybee Island’ is actually twice the size of Tybee Island proper, though you probably won’t even realize the difference traveling between the two, as most people just consider it all Tybee Island in general. Little Tybee is only accessible by boat, going to Back River most commonly. You will find several nature excursions and water recreation options on Little Tybee, you can even rent a boat, kayak, or jet ski while here! Fort Pulaski National Monument - The battle of Fort Pulaski is considered ‘a landmark experience in the history of military science and invention’ (NPS) and is still widely talked about amongst war historians. Not only was this an important wartime spot, but it also served as a popular Underground Railroad stop. Your group will be able to tour the outdoor fort exhibit, take a guided tour of the indoor museum, and even walk the several different trails surrounding the site. There are 5,000 acres of parkland surrounding the site, mostly filled with marshes and flats. This is a great spot to learn about both historic local happenings and local wildlife! Third Thursdays - During the months of March-May, as well as September-October, Tybee Island enjoys live music and entertainment throughout the boutiques and eateries around the island. Movies in the Park - Enjoy free movies in Memorial Park each third Saturday of the month during the months of June, July, and August. Tybee Beach Ecology Trip - Join marine scientists and biologist Dr. Joe Richardson and learn all about the animals and habitats of Georgia's beaches and barrier islands. Fossil Hunting - Search the Savannah Riverbed, which has been dredged since the 1800s, with Sundial Charters. Find treasures in hotspots such as Shark Tooths Island! Dolphin Cruise - Captain Mike's Dolphin Tours has been family owned and operated since 1992 and has earned the title of 'Best Adventure Tour' on Tybee Island since 2003. Meet at Lazaretto Creek Marina and head off on a journey to spot as many bottle-nosed dolphins as you can! Tybee Beach Clean Up - Be a part of any of the regular beach cleanups along the shore, volunteers gathering plastic, butts, styrofoam, bandaids, and any other litter along the way. 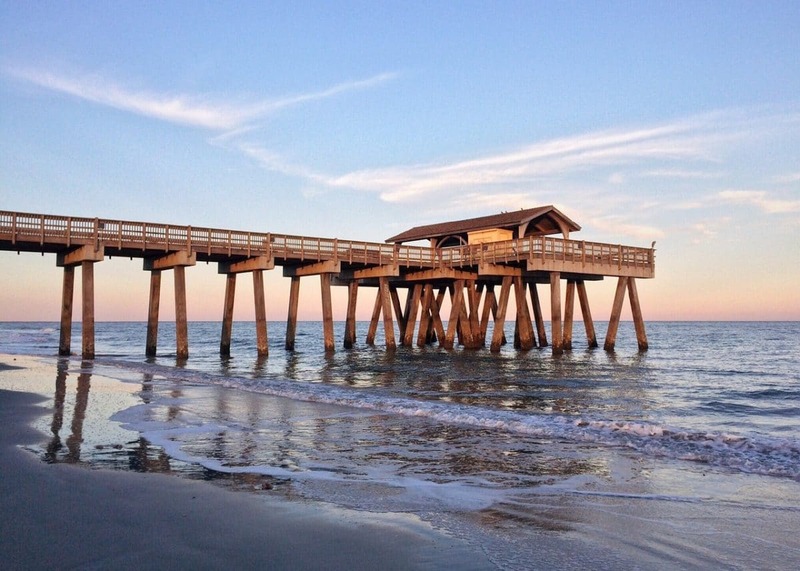 Check out more specific information about Tybee Island and Savannah!